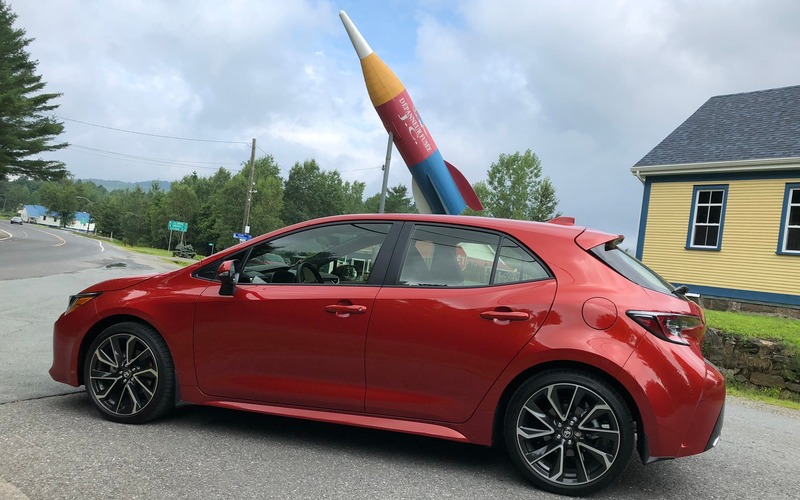 The Car GuideTests and FeaturesFirst Drives2019 Toyota Corolla Hatchback: Excitement Included! ORFORD, Quebec – Everyone mocked me for being excited about this car. The truth is that before I went off on this official product launch, I’d already driven it. I knew what I was in for, but for a moment I must admit I thought maybe I’d gone too far trying to hold my breath for eight minutes at my son’s birthday party to impress the kids… After spending a few hours at the helm of the Corolla hatchback, I stand firm on my claim. The 2019 Toyota Corolla hatchback is, in fact, not a Corolla. Factually speaking, it is a Corolla, but it’s not meant for typical Corolla drivers. You know, the ones that signal their intent 12 to 15 minutes before they actually make a move? The ones that find a way to run out of parking space at Costco and somehow line up four inches away from your car on the passenger side, making it impossible to get your child in the car? Also: 2019 Toyota Corolla Hatchback Revealed! The Corolla? Exciting to Drive? I’m only half kidding. I’ve driven a bone-stock 1986 Corolla; the one everyone refers to as the AE86. The legendary front-engine, rear-drive, two-door coupe was overwhelmingly underpowered, but handled incredibly well. If you know about this car, consider that the new hatchback is for you. If you’re familiar with the Corolla, but think I’m just throwing about letters and numbers to try and impress the kids again, best you wait for the next-generation Corolla sedan due out sometime next year. The new 2019 Corolla hatchback shares the fantastic new Toyota New Global Architecture or TNGA platform, which also underpins the new Toyota Avalon, upcoming RAV4 and the thing they call the C-HR. The story about this car unfolds under three points. The first is drive and handling. Thanks to the TNGA, the hatchback is hands-down the best-handling Corolla ever assembled. The fully independent suspension (multilink in the rear) has only to juggle the car’s reasonable weight and not cope with a flexing chassis when slicing through the countryside as we did. The all-new 2.0-litre four-cylinder Dynamic Force engine’s specs read as very competitive, but in reality, fall a little flat. Despite producing 168 horsepower at 6600 rpm and 151 lb.-ft. of torque at 4800 rpm, the Corolla lags behind performance-wise. The Volkswagen Golf and Mazda3 Sport will run circles around it. However, the latter two will need to stop for fuel sooner than the Toyota. Equipped with the direct-shift CVT, the hatchback should return an average of just over 6.5 L/100 km. This new CVT is one of the best I’ve ever experienced thanks to a physical 1st gear that takes on acceleration from a dead stop. It effectively eliminates the elastic-y impression upon throttle input. The new six-speed manual is an equally commendable piece of kit. It is very easy to use and even includes a rev-matching function. The second part is design. You’ll all agree with me when I say this does not look like an archetypal Corolla. 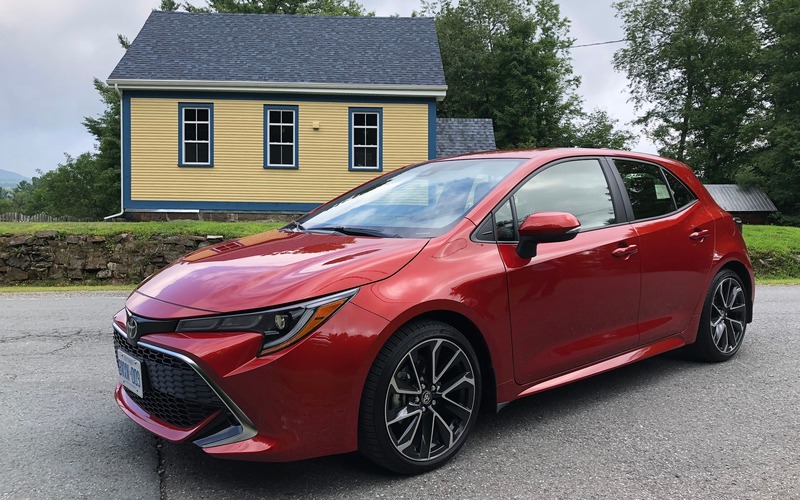 Admittedly, the ex-Scion iM, then Corolla iM, was no typical Corolla either, but this car’s 30-mm wider, 40-mm longer and 25-mm lower body than the iM gives it more presence. Depending on trim and options, 18-inch wheels, a rear spoiler and some aero bits can be included. Bottom line, car looks great. 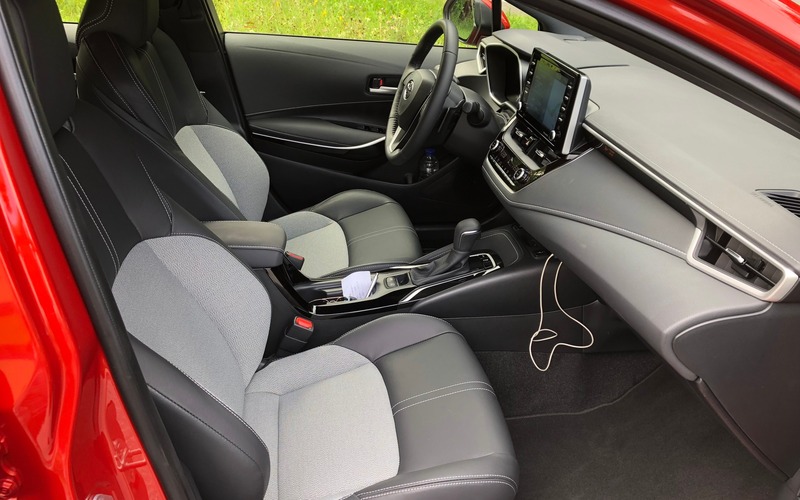 And lastly, the 2019 Corolla’s level of tech is huge, and it speaks volumes about who the car is for. Standard features include a 4.2-inch, multi-info gauge display and the eight-inch touchscreen is the access point for Toyota’s Entune 3.0 (Entune App Suite Connect including Traffic, Weather, Slacker, Yelp, Sports, Stocks, Fuel and NPR One), and Apple CarPlay integration. For the moment, Android Auto is not available, but it should be before long. On top of all this, one can also purchase a dashcam, developed and built in Canada, for about $450. There are countless safety features as well incorporated with Toyota’s Safety Sense 2.0 such as pedestrian detection, pre-collision alert and lane departure alert with steering assist. So then, is this the greatest compact hatch in the segment? No, it’s not. The 2019 Toyota Corolla hatchback is far more compact than it should be. The boot is nearly useless with little depth or height. The rear bench is cramped for two adults if two more are sitting up front. There’s little storage to speak of and on a related note, some of the materials that make up the car’s snug cabin are, in a word, cheap. If you drive it and consider the features, you’ll love the Corolla hatchback, but make sure your life fits in it! 8/10	This is not the Corolla you’re looking for. If you’re shopping for cramped quarters, want a tiny trunk and a superb driving experience, then this is your car.